Mardi Gras is February 9 and the editors of TeaTime have created a lovely Mardi Gras tea party to celebrate. Their menu includes the delicious creole and cajun flavors of Louisiana. I find that a tea party is an excellent, family-friendly way to enjoy this special winter holiday! TeaTime started their menu with a scones course of Brown Sugar and Cream Cheese Scones, followed by Dilled Crawfish Salad Tea Sandwiches, Jambalaya Tarlets, and Muffaletta Palmiers for the savories. Of course, dessert wouldn’t be right without that Mardi Gras signature, a King Cake. And they’ve rounded out the sweets tier with recipes for Toasted Pecan Pralines and Bananas Foster Tartlets. Not sure which teas to pair with seafood? They recommend organic Mango Sunny Passion from Capital Teas for a light and fruity complement to the savory-sweet blend of flavors created by the crawfish and shrimp. The complete menu was more than I could include here, but I’m excited to share their Jambalaya Tartlets and Toasted Pecan Pralines with you. I hope you enjoy these special winter holiday treats! Now, as they say, laissez les bons temps rouler! And be sure to pick up the January/February issue of TeaTime for all of the delicious recipes. 1. Preheat oven to 450˚. 2. On a lightly floured surface, unroll pie dough. Using a 4.-x-2.-inch tartlet pan as a guide, cut 12 shapes from dough. Lightly spray 12 tartlet pans with cooking spray. Press dough shapes into prepared tartlet pans, trimming excess as necessary. Using the large end of a chopstick, press dough into indentations in sides of tartlet pans. 3. Place tartlet pans on a rimmed baking sheet. Refrigerate for 30 minutes. 4. Prick tartlet dough with a fork to prevent puffing during baking. 5. Bake until golden brown, approximately 7 minutes. Let cool completely. 7. 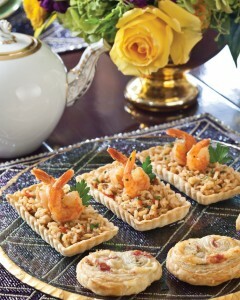 Spoon warm rice mixture into tart shells, arranging shrimp decoratively on top. 8. Garnish each with minced parsley and a parsley leaf, if desired. *We used Tony Chachere’s Creole Seasoning. Make Ahead Tip: Jambalaya can be made a day in advance, placed in a covered container, and refrigerated. Warm gently before filling tartlet shells. Tartlet shells can be made early on the day they are to be used. 1. Line 20 wells of a 24-well mini muffin pan with foil baking cups. 2. In a heavy-bottom medium saucepan, combine brown sugar, granulated sugar, cream, butter, and water, stirring to blend. Cook over medium-high heat, stirring constantly until mixture registers just below 238˚ on a candy thermometer. Remove pan from heat, and add pecans, stirring vigorously to cool mixture slightly. 3. Working quickly and using a levered 1-tablespoon scoop, divide pecan mixture among prepared wells of mini muffin pan. Let cool completely. 4. 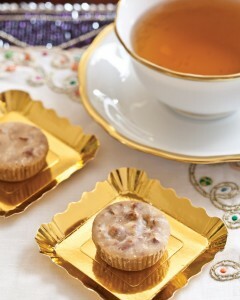 Store pralines in an airtight container at room temperature. 5. Remove from foil baking cups before serving, if desired. How will you celebrate Mardi Gras? Some charming ideas so older people can have a special time. Here Mardi Gras is celebrated by the Gay and Lesbian community with parades and parties. Lots of fun for all. And you do not have to be LGBT to participate. Definitely no king cake or afternoon tea. In my city Western Christians celebrate Shrove Tuesday. Orthodox Christians do not observe this day at all. Other people celebrate Pancake Day. At least everyone around the world has some type of pancake. The pancakes a good fundraiser for schools. I have always dreamed of going to the Mardi Gras in Louisiana! One of my friends go every year. She has shown me lots of fabulous pictures of the town, the restaurants and of course the colorful parade. I just might have a Mardi Gras tea party this year with friends and family. Thanks for the inspiration! 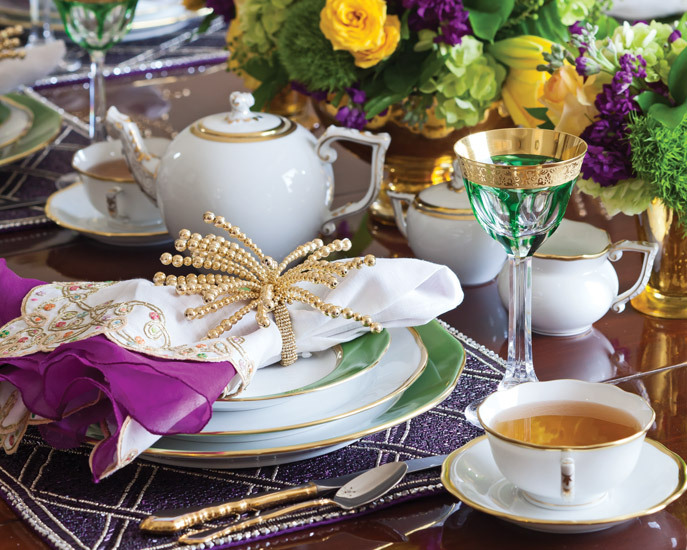 The traditional colours of green, purple and gold are done beautifully on your table in celebration of Mardi Gras. We moved from the Midwest to California and still celebrate Mardi Gras by usually going out to dinner or eating well with friends before Ash Wednesday and on to lent. Lent is a time for introspective thinking and church services In wait for Easter. I think a tea… With family and friends…:: filled with good food and fun sounds absolutely wonderful!!! I only wish my grandchildren were closer, because as I’ve said before, they LOVE dressing in my hats, scarves and glove to enjoy a good tea party. Thanks again for the recipes!! What a nice way to celebrate Mardi Gras right before the Lenten season. I lost my 91 year old Mother in October and her birthday was February 9th. I just might have a little tea party in memory of her on that evening. This gave me some wonderful ideas and inspiration. Thank you. Wow! Makes one long for Spring. This sounds like so much fun! Here in California we don’t really celebrate Mardi Gras, but in my native country The Netherlands, they do. The tea looks beautiful, tea is such a wonderful way to celebrate with family, I am going to make those Pecan Pralines, they sound scrumptious!